Written by Brandon Barrows with art by Bill Blankenship, with nothing left to lose, Monkey Business, one of Jack McGriskin’s oldest super-powered enemies, cuts loose and rampages through the streets of Boston! House of Fear: The Grumpledowns Gang – It’s Kids vs Lovecraftian Horrors in a new, all-ages comic now on Kickstarter! THE House of Fear: The Grumpledowns Gang and the Case of the Mail-Order Shoggoths, published by Ten31 Publishing, is a comic I’m exceptionally proud of. You may have read my detective series Jack Hammer (Action Lab) or my horror graphic novel Mythos (Caliber Comics), or maybe not. Those are, after all, both books targeted at specific audiences. But I’ve wanted to do something that appeals to the widest possible audience, something truly all-ages for a long time. Something anyone can pick up and enjoy, whether they’re long-time comics fans or just getting into them. Why? Because I read a lot of all-ages comics myself, comics that are supposed to be fun and accessible to anyone. And while there are a lot of comics out there that claim to be just that, many aren’t. Too often, unfortunately, “all-ages” translates to “kids’ comics” in the minds of publishers and fans. Don’t get me wrong, a lot of what’s out there is perfectly fine for beginning readers, but kids confident in their reading and adults won’t find much to enjoy in them. Truly all-ages books like Spongebob Comics, Mouseguard, The Stuff of Legend, and the Adventure Time comic, when it was written by Ryan North, are all-ages books that are not only that, but series I really enjoy. They’re fun, action- and story-packed comics that work on multiple levels directed at multiple audience so well that it almost seems effortless. They are also stories that meant something. They aren’t just fluff meant to fill pages and be forgotten once you’ve finished reading. And that’s what I wanted to create, too. Targeting audiences is perfectly fine, and often a smart thing to do, but I wanted to do something different with my next project – something everyone can enjoy, regardless of age. Something an adult or a kid can read and enjoy on their own or that they can enjoy together. When Ten31’s publisher, James W. Powell, gave me the chance to do exactly that, I had an idea, but wasn’t sure if I was up to the task of creating something on the level of what I was hoping for. Despite those misgivings, I took the idea I had and wrote a comic from it and, while it was pretty decent, James then helped me tweak and refine that script until it truly became one of the best I’ve ever written. James then did an amazing job (seriously, he’s a fantastic editor and publisher) of finding the best artistic talent to bring it to life. The Grumpledowns Gang are kids, but theirs is a fun story that kids or adults or anyone in between can enjoy and get their fill of scary fun and action – and maybe even take note of a little life lesson tucked in there somewhere. And the art is just amazing. It’s beautiful, but more than that, it’s incredible to me that it’s virtually exactly what I saw in my head. Artists Rafael Loureiro and Josh Jensen make a powerful team on the interior art, James Hislope’s front- and back-cover pieces are creepily gorgeous and Matt Krotzer’s letters are some of my favorite in the business. If you like comics, horror fiction or have a kid who likes either, if you’ve ever read any of my comics work or if you haven’t, but want to give it a shot, please check out the Kickstarter campaign Ten31 is currently running, pledge your support and share the word. This is a very important book to me, with characters I care deeply about, and if it’s successful, I’ll do my best to bring even more of their stories into the world. “IF” – the word itself has helped to turn science fiction into science fact; making the impossible become possible. Celebrating a new theme with every annual release, 2015’s IF anthology boasts 36 creators coming together to tell 15 thrillingly original stories of time, space, technology, and other tales from beyond. While this anthology boosts various stories, in sub-genres of science fiction they have one thing in common. Despite the briefness of each story, they each seem to share the same purpose of what a story is supposed to be, entertainment. I will admit some of the stories could have been easily drafted into the old Twilight Zone episodes. While others, would have a challenge adapting to another medium ,which give them their own greatness. In a similar vain to the stories, each one shares a different approach to its artwork. However they all share the same monochromatic aesthetic. Which gives the entire anthology a sense of unity, despite the different artistic approaches in both story telling and artwork. Al Vacarro is a made-man, with all the honors and responsibilities that entails. But after a lifetime of violence in service of the Castella crime family, the mob no longer holds any allure for Al. For the sake of his own family and his very soul, he needs out of “the life.” But how does a man escape the only world he’s ever known? Unmade is a tale of blood and desperation, and these are the last twenty-four hours of life as Al knows it. I’m a fan of a comic you can pick up and read the entire thing front to back without needing to know anything, one-shots feel like a rarity these days. Unmade is just that, bringing the mob to comics. Even though this type of subject is a genre that we’ve seen dozens of times on film, television, comics, and books, Unmade still feels unique and I honestly had no idea where it was going. Writer Brandon Barrows makes the main character Al just despicable enough to feel like he fits in the world of the mob, but at the same time we kind of want him to get out of the world for his family. What I think is really impressive is even though Barrows uses a lot of what might seem common in these types of stories, how he weaves the story, and the small details feel new. He’s done the impressive thing taking a well worn genre and giving us something new. 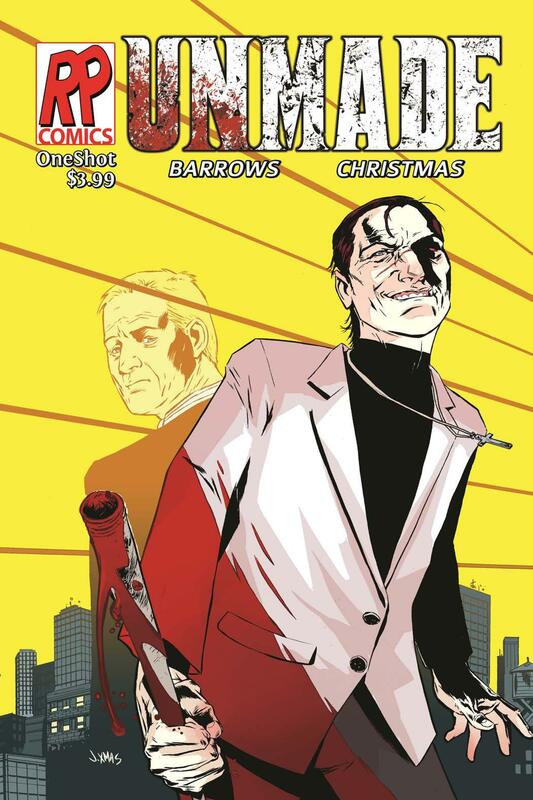 The art by Johnnie Christmas with colors by Josh Jensen is really solid and it reminds me a lot of what I’d expect from 80s British comics. The coloring especially has a bit of a “retro” vibe to it all. The story and style have a solid mix and compliment each other well. This was a one-shot, but I actually want more! That’s the funny part, here’s a comic I’d love to see more of, or an anthology series. There’s lots of different options here, especially the way the comic ended. Barrows is a talented writer, and this comic shows off his abilities. If you’re a fan of indie comics, or classic mob stories, this is one to absolutely check out. Betrayed, bloody and mad as hell, it’s Jack’s turn to go on the hunt, sucking chest wound or no. But Jack hasn’t even met the man called Usurper face-to-face and he’s already fighting for his life.With both Jack and Ramona’s lives on the line, who’ll go down for the count? Just as things are starting to get back to normal for Jack McGriskin and friends, a new shadow falls across their path… and lands squarely on Ramona! A mystery man stalks her through the streets of Boston, but is she his target or only a means to an end? The conclusion to the “Political Science” storyline! Jack McGriskin may be down, but he’s not out. The Black Smile is confident he’s won, and that might just give Jack the edge he needs to bring one of Boston’s most-notorious killers to justice at last! But he’ll need a little help–okay, a lot of help–from his friends! Variant cover by Rafer Roberts. With the architect of Eddie Newman’s death revealed, Jack goes on the offensive to confront the mastermind pulling the strings of Boston’s underworld and rescue Newman’s kidnapped widow. He knows the who and the how, but the questions remain: why? And does he stand a chance? Part of this review originally ran in 2011 when the series was published by a different company. Jack Hammer is back with a new publisher behind the detective’s adventures. Originally published by Reasonably Priced Comics, The detective meets super powers series by writer Brandon Barrows and artist Ionic has a new publisher Action Lab Entertainment as part of their “Return of the Hero” line of comics. With the architect of Eddie Newman’s death revealed, Jack goes on the offensive to confront the mastermind pulling the strings of Boston’s underworld and rescue Newman’s kidnapped widow. He knows the who and the how, but the questions remain: why? And does he stand a chance? 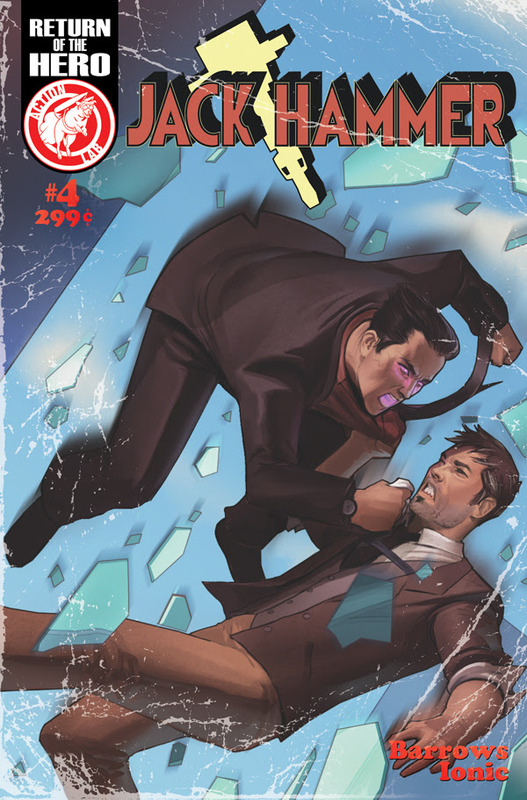 The protagonist Jack Hammer is still on the trail of the murder and winds up going against a villain from his past. Much I like I thought when I originally reviewed this comic, even three years later, it’s still a nice solid read, it’s good. Sporting an entertaining mix of super heroes and a crime/noir story it hits the notes you’d expect as far as dialogue, character personalities and action. There’s great flow to the story. There’s also been a lot of growth over the three issues as far as the look and style of the characters, many of the nitpicking issues I had with the first issue have smoothed away and/or grown on me. The style fits the series and makes the comic series stand out a bit. Issues I had with things like hair are not as prevalent, as a depth that was missing at times has been added. The angles and use of panels is solid as well. There’s one more issue to go in this volume, and it’ll be interesting to see if it still holds up over the years. I expect it’ll leave me with the same satisfied feeling I had during the first read through. Hopefully we’ll see more of Jack Hammer through Action Lab, a publisher that seems like a perfect home to him and his world. This issue also sports an amazing variant cover by Des Taylor.